Okay, it's Sunday, not Friday, I know, I know. But I think you'll cut me some slack when you see what a behemoth this recipe was. Lordy! 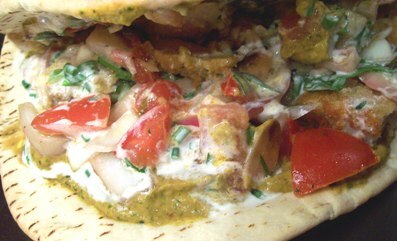 Anyway, this dish is right up my alley, a mix between a gyro and a taco, lots of sauces, easy to improvise with, just your basic messy, gooey goodness. It's perfect. Here's my take on the creation, notes on the cooking process and of course my critique of the fabulous Baco! This one was pretty easy to make, one of those satisfying dishes that's great to have in the fridge, for this dish and others. 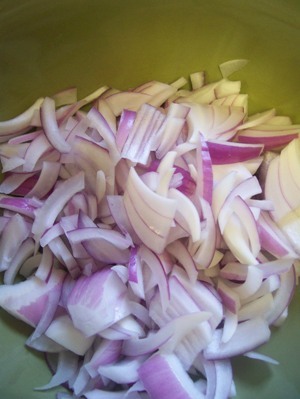 Then simply pour the piping hot mixture over the onions, let it sit for 2 hours, stirring occasionally. The Results: This was simple to put together and tasted fantastic. It was sweet and tangy with just a hint of a spicy kick. I had some bread sitting out and couldn't help but rip off little chunks to dip in the sauce. This is a definite keeper. I don't know why but I couldn't find creme fraiche at 2 stores that I went to. 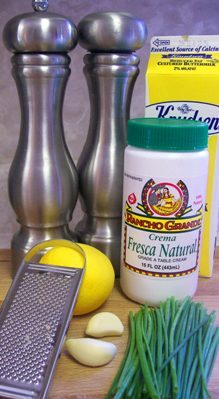 I had all the other ingredients except this and so I settled for Crema Fresca Natural, which in hind site was a mistake. I'd never used it before and as you can see the bottle is not see through, so it was sort of a crap shoot as to what I would get when I opened it. Anyway, the consistency is more of a really heavy whipping and less of a cream cheese kind of feel. Anyway, this too is quite easy to make. Simply beat the creme fraiche with a hand mixer until it's light and airy. 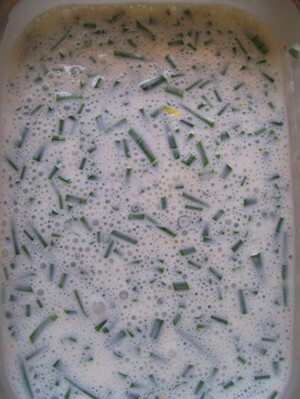 Then mix in the buttermilk, chopped garlic and chives, lemon juice and lemon zest and season with salt and pepper. 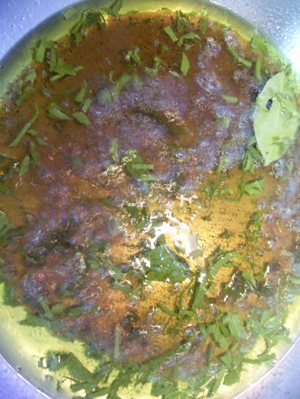 The Results: As you can see the consistency of this sauce is super thin - a mistake fixed by using what the recipe called for and not a last minute substitute. Oh well, chalk it up to a "live and learn" moment. Other then that, it tasted quite delicious. Creamy, sweet and tangy all at the same time. Since there is quite a bit of heat in some of the other sauces, I think this is just the right bit of coolness the Baco needs. There was a little more prep to this baby. Roasting the peppers and the chili, toasting the bread and the nuts. But after that, all you do is pop all the ingredients into a blender or food processor and bada-bing, bada-bang, you've got sauce! The recipe calls for you to push this sauce through a medium mesh strainer, and as I was doing it, I couldn't understand why. In my opinion, it didn't need it at all. But upon reading the recipe further, I realize that it doesn't call for you to seed the peppers or the chilies before blending everything together. I removed the skin and seeds from all of them after they were roasted and cooled. Perhaps I'll do it again the other way and see if it changes the taste, but if not, I think it's much easier to remove seeds ahead of time rather then sit there with a strainer. The Results: As you can see in the photo, this sauce doesn't look as pretty as I'd hoped. Anyone with kids can perhaps imagine what I was thinking it looked like. 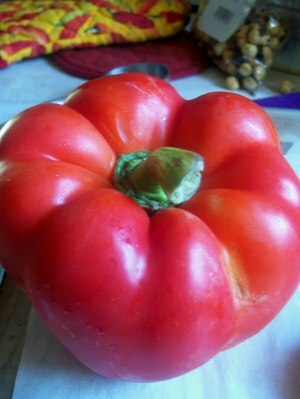 Maybe this is because I used a yellow pepper and not a red one? Regardless of how it looks, it tasted phenomenal, it really did. It was smoky with a great smooth texture. There was also a little bit of fire in the after taste... this one is a real keeper. There was a bit of dicing going on with this sauce (which isn't really a sauce), but other than that, again, pretty easy to create. It called for whole almonds. Two things: first , I only had sliced almonds, second, I just couldn't imagine biting into a whole almond in the middle of my baco. So, I toasted the slivers instead. 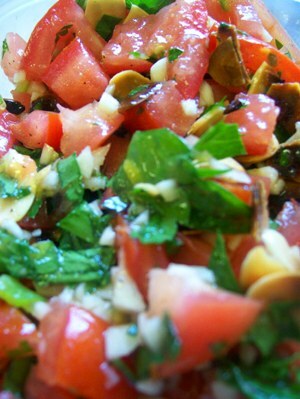 After cutting up the parsley, tomatoes, garlic and serrano, you simply mix it all together with the vinegar and oil, lemon zest and salt and pepper. The Results: I loved this, I was surprised at how much I loved this. The crunch of the nuts (still glad I chose not to use the whole ones) and the garlic were fabulous. Oh yeah, the garlic, Holy Cow! 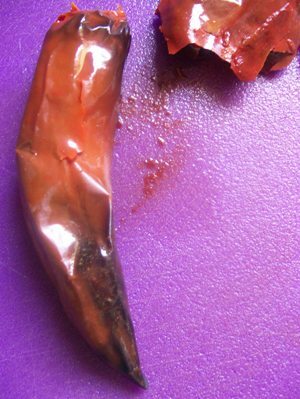 It called for 6 cloves - this is not a first date kinda sauce. 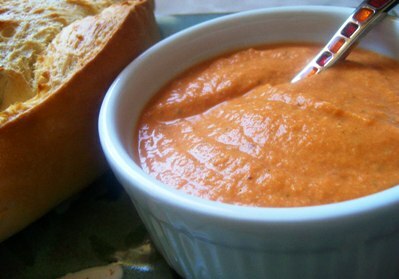 My research found that Salbitxada (pronounced: Sahl-bee-tcha-dah) is a Catalonian kind of Romesco. 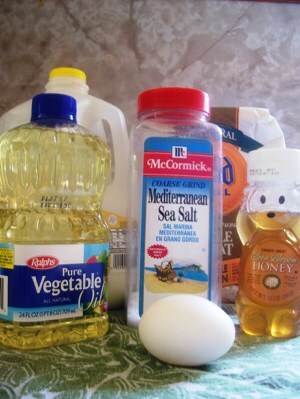 Other recipes I saw called for blending all the ingredients up. I enjoyed this chunky version quite a bit, but would like to try it blended together as well. Next, it was time to cook the fish. 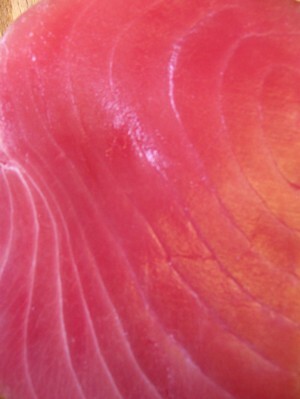 Ahi is pretty pricey, luckily a little fish goes quite a long way in this dish. You basically mix minced shallot, chives, parsley and lemon zest. Then beat some eggs and put in a bit of the herb mixture into the eggs, reserving the rest. Also, set out some panko (fancy bread crumbs.) 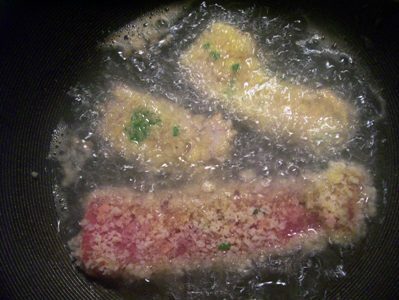 Cut up the fish, dredge it in the egg mixture then pop it in the panko. It looks pretty already. Then heat your vegetable oil up and cook the fish very quickly in the oil - only for about a minute. Once cooked, remove the fish and set it to drain on a paper towel. The Results: I think I was supposed to cook larger chunks of the ahi and cut them after cooking. If I had done this I think the results would have been better. By cooking the pieces so small, it was very easy to overcook them, and over cooked ahi is a yucky no-no. 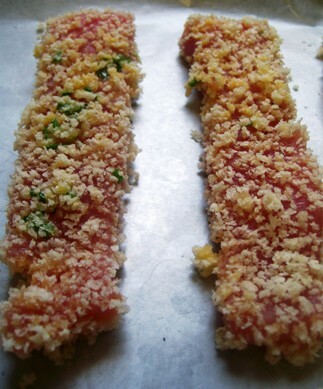 The panko coating gives the fish a very satisfying crunch! 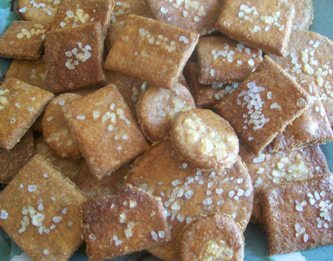 I salted them a bit right as they came out of the oil and I think it was a good touch. Now, finally, all the elements are ready to come together. I heated the flat bread up on the grill and then began to assemble the Baco. This was the fun part!! The Results: I'd definitely give this dish a thumbs up, although next time I think I'd do it with some braised pork or some grilled chicken. Since all the sauces do well in the refrigerator for a couple of days, this is certainly a good dish to do for a bbq. You could make everything a day or so before. I actually transported all the fixins over to my "BFF" Vanessa's house and we at it there. 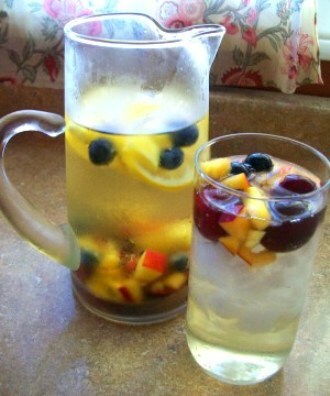 Which brings me to Vanna's contribution to the meal, a delicious white sangria. Ain't it pretty? 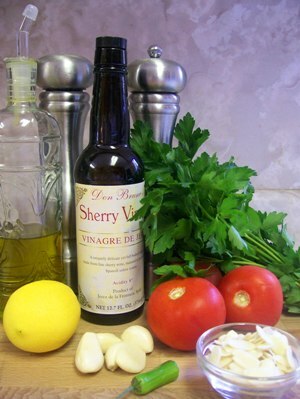 It was very flavorful and altogether it was a perfect summer meal/drink combo. I'm looking forward to going to Lot 1 for lunch and trying one of Chef Centeno's Bacos and see how they compare to the ones I made. If you try the Baco's, please leave a comment or shoot me an email!! I'd love to know what you think of the recipe and how your Bacos turned out. Okay, fine, I'm just trying to distract you, make you laugh, or butter you up. I'm hoping you'll be kind to me, when I bare my soul and share with you, my utter lack of talent when it comes to baking. It's true. While I consider myself an excellent home cook , my baking prowess, or lack thereof, is pathetic. But, I am determined to change it! I think it's the precision of it all, so much measuring! There are so many amazing bakers and fellow bloggers out there, and I would love, love, love your tips and feedback (or words of encouragement!). So here's how it all went down...I decided to make the Romesco sauce from last Wednesdays LA Times Food section. I think 90% of the failure of this recipe was operator error. If I was more confident in my baking I would have fixed the dough early on. The flavor was nice, although I would add a bit more honey. 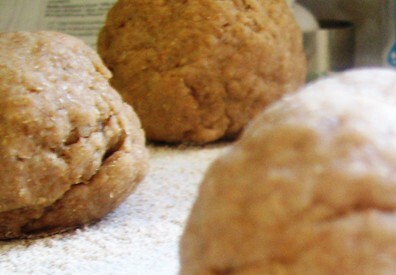 If any of you seasoned bakers out there would like to give me a holler and let me know what I should have done to fix the dough, I would love the information. Earn and learn, that's our motto! Until this Friday, where I'm happy to say, I'll be making a salad recipe from the food section, Cheers! I look forward Wednesdays. That's the day the Los Angeles Times comes out with it's food section. That's not to say I don't have one major beef with them, and that being, their overwhelming neglect of the Valley. There are rarely reviews or articles, that have an even remotely "Valley-centric" view, I aim to change that, as I believe my little corner of Los Angeles has a population with great tastes and a big need for fine dining right in their own back yard....(getting off my soap box). Even so, I enjoy perusing the section over my cup of coffee, wincing when a restaurant receives less then 1 star and cheering when they receive more. Of course I always turn to my fellow bloggers to see who has gone to the restaurant themselves, and compare reviews. Then, there are the recipes. Seasonal recipes ranging from simple to complex, some from staffers others from contributing writers. I always tell myself to save the paper, clip my favorites, and actually try making some. But I must confess, after 20 years of reading the paper, and 5 of reading the food section regularly, I have YET to clip or try my hand at even one of their recipes. Handsome cohort has actually clipped, but alas no cooking has resulted from said clipping. Of course I am not alone in this. ..right? In that light, as I delve deeper into my "blogism", I am vowing to try at least one recipe from my local food section, per week. This, of course, is not an original or uber inspired idea, just my way of staying motivated to try new ingredients and cooking methods. Plus, don't you always wonder how good those recipes really are from those setting themselves up as the arbiters of taste? Before I go further I must mention the Wednesday Chef Website authored by Luissa Weiss, who has been blogging since 2005. She may very well be the originator is this fun way to cook. She takes, and creates, recipes from the LA and New York Times food sections and then tells her readers like it is, in an honest and amusing way. 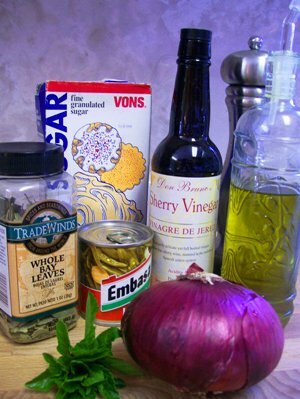 Unlike Wednesday Chef, Sunday Dish doesn't have the wherewithal to review more then one recipe a week! 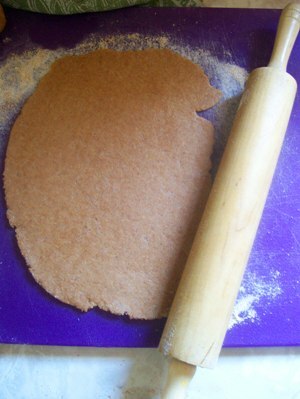 Nor do I have a stack of cut out, yet never used recipe clippings. None-the-less, Luissa at Wednesday Chef, and all the other creative bloggers out there, have truly inspired me! That is why I decided that Fridays will now be: "Food Section Friday." Of course, being an Angeleno, I will draw mainly from the Times. But I'm giving myself a bit of wiggle room, leeway if you will, to borrow from the food sections of other cities. 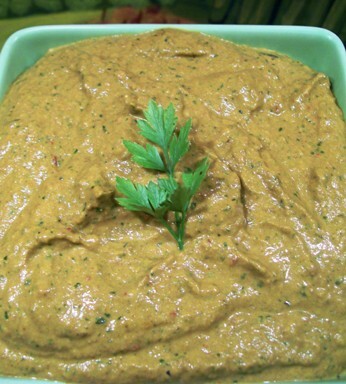 - 1 tablespoon minced flat leaf parsley. 1. Place a rack in upper third of oven and heat the oven 375 degrees. Stick a fork (I used a knife) through the peppers and place down in a bowl to keep the peppers submerged. 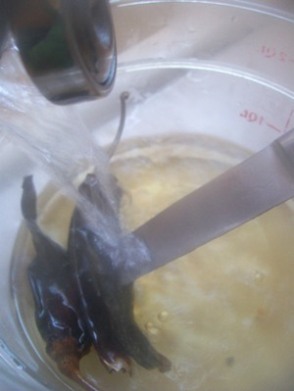 Cover with boiling water for at least 30 minutes to soften, then stem, seed and set aside. 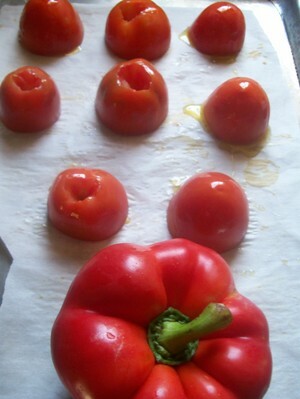 2. while the peppers are softening roast the red pepper on a gas stove or under a broiler. Place the pepper in a plastic bag or in a bowl covered with plastic wrap, and cool. 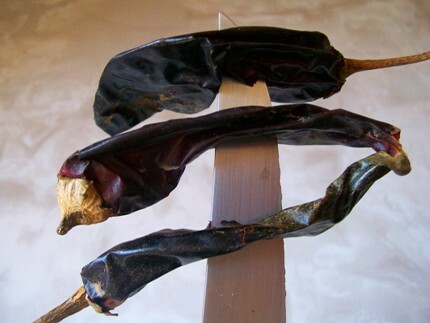 Peel, stem and seed the pepper, don't rinse, set aside. 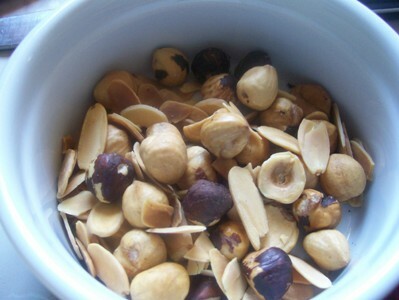 3. toast the nuts in the 375 degree oven until golden and aromatic, 8-10 minutes. If the hazelnuts have skins, cool and remove by rolling them in a kitchen towel. 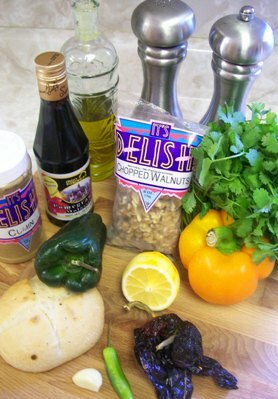 Set aside the nuts and increase oven temperature to broil. 5. In a skillet heat the rest of the olive oil and fry bread to golden brown. Cool and set aside. 6. In a food processor (note: I used a blender) coarsely chop the garlic, salt, fried bread and nuts. Add the peppers, tomatoes, paprika, vinegar and parsley and process to a rough paste. 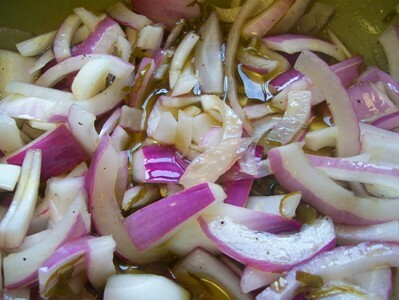 Slowly pour the remaining olive oil in a steady stream and process until combined. This was a an easy recipe to follow considering all the little odds and ends there were to do, in order to get it all together. There was the minor irritation I suffered in not being able to find the peppers, but when it comes to cooking you often have to punt, and so I did. The flavor of this is terrific (although Little Chef - my daughter - found it a tad too spicy.) 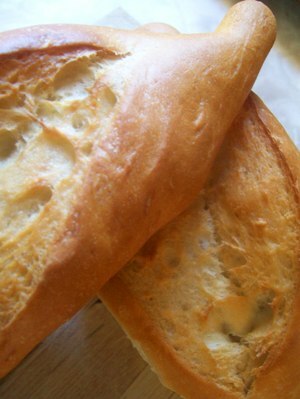 The nuts and toasted bread give it an underlying richness, a smokiness, that is unique and very delicious. Be forewarned, if you have a date, you may want to lay off the sauce, the garlic flavor is pretty intense. Since my kissing partner is out town for the next week or so, I dug into it with gusto!! 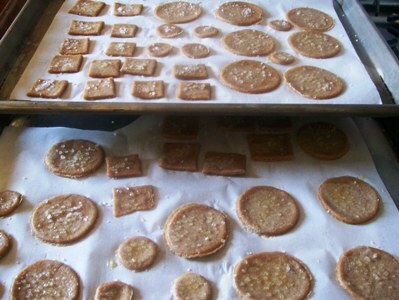 To go with my Romesco I created another recipe from this weeks Food Section: Peter Reinhart's Thin Wheat Crackers. This one was not quite a success. I'll fill you in on the details of that endeavor, later in the week.